Providing a 24 hour complete locksmith service to south London and surrounding areas. I offer a professional service with many years of experience in the locksmithing trade. All work and materials are fully guaranteed. I have been trained by the professional body of (Master Locksmiths Association) and the (British Locksmiths Institute). I am fully trained in dealing with customers feelings when a break-in has occurred or any other stressful occurrences. I have the answer to all your security questions for your home or commercial premises. 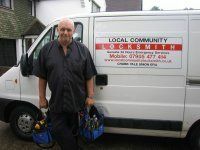 my clients include local Councils, housing associations, Neighbourhood watch, estate agents, property letting agencies, security companies and the best reference any company can get in the locksmith trade, the Metropolitan Police. See my special offers page! Genuine 24 Hour Locksmith In South London. We carry stock and fit the following locks (all to British Standard) Chubb, Yale, Union, Era, Ingersoll, Evva, in fact most makes supplied and fitted. With every front door rim cylinder and mortice lock changed at the same address, I will supply and fit a London security bar, or a door viewer free of charge when you quote this advert. Please note the cost of this free offer would normally carry a charge of £25.00-£30.00 if ordered separately plus a fitting charge. All work and materials are guaranteed and insured so can be sure quality workmanship is being carried out. Put my number in your mobile phone, you never know when you might need it!